The bubbly has barely dried on Chris Bosh’s neck, and already the folks at 2K Sports are talking about next season. 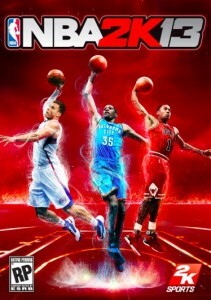 NBA2K13 will feature a trio of the league’s brightest young stars on its cover when the big-selling basketball sim drops this October. Oklahoma’s Kevin Durant, Chicago’s Derrick Rose, and Blake Griffin of the L.A. Clippers will share the honors. Good choices, sure, but we were kinda hoping Brian Scalabrine would get his just rewards.